Is the Apple Watch a Tool for Enterprise? Four months ago, the tech world was buzzing about the hotly anticipated Apple Watch. Consumers couldn’t wait to get their hands on the next big thing. We were eager to try it out as well. Apple’s iPhone and iPad had high adoption rates from the start and are invaluable assets for many companies. Surely the Apple Watch is another game changer for business. At its launch, 1.5 million Apple Watches were sold. But since then, sales have waned. The success of Apple’s products is largely based on good word of mouth from early adopters. In this case, early reviews were mixed. I don’t know, the #AppleWatch should either have the basic functionality of an iPod nano or the full standalone usability of an iPhone. Along with that, our user research unveiled a few other factors that make the Apple Watch a tough sell. Connectivity. The Watch only works when tethered to an iPhone. While it allows you to get alerts and notifications right on your wrist, it’s not saving you from also having to take your phone with you everywhere you go. Usability. All functions operate with a few clicks or scrolls. However, there is no typing capability. Texts are limited to canned responses or voice commands. Depending on the size of your fingertips, the interface of the home screen can be difficult to navigate without error. Cost. iPhone – minimum $300. Standard Apple Watch – minimum $549. That’s nearly a thousand dollar investment per user. Even with the slowdown in sales and its limitations, companies are wondering if there is a place in its mobile strategy for the Apple Watch. SAP is currently beta-testing smartphone applications that would tie into a company’s core business functionalities, including Fiori Cart Approval and SAP Mobile Documents. A few applications have already been developed in an effort to increase productivity and streamline efficiency. How many of these are truly increasing productivity and were not just created for the sake of harnessing new technology? Cases have been made for how this can help personal productivity. Notifications are sent right to your wrist, saving the time of fishing your phone out of your pocket. The gamification of the fitness feature motivates people to reach their fitness goals. And because the Watch is only providing you bare bones updates, it prevents users from getting distracting from other apps like the iPhone can. How can this translate into business? We can make a case for retail. The Apple Pay feature is certainly worthwhile. It would allow customers to pay with the flick of their wrist. Also, utilizing geolocation, exclusive promotion alerts could be sent directly to someone while in the store which might entice a window shopper to buy. From a usability standpoint, our experience and research have found the capabilities of the Apple Watch are still limited for enterprise. We provide our clients simple solutions by creating enhanced user experiences through the most innovative technology. But in the case of the Apple Watch, it’s tough to make a case for investing in an application that already increases productivity on an iPhone or iPad (devices that many more users are able to bring into a BYOD situation, which is also worth mentioning). 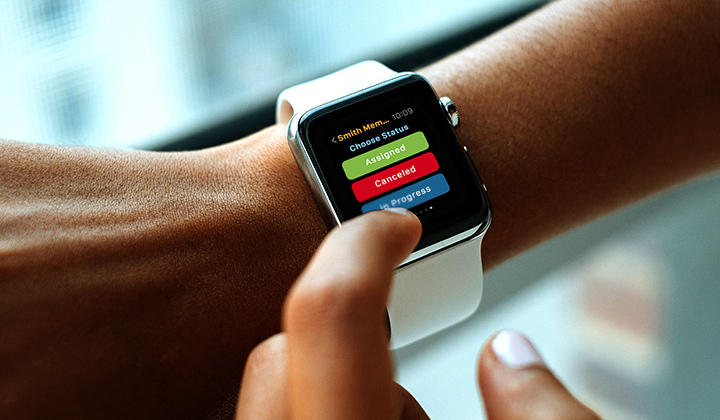 Tell us what you think – would the Apple Watch make a difference in your company’s way of doing business? Are their applications that can be developed to improve your supply chain management? Would approving inventory reorders directly from your wrist improve your workflow? Can you make a case for usability or do the strengths of it remain to be seen? Enterprise iOS Developer here. Over the past three years I have worked for one of the world’s largest medical device companies, a two top 5 international pharmaceuticals. In that time I have built apps that train sales staff on upcoming products, apps that compare the clients products to their competitors to be used by sales staff in the field, an app that almost completely automates the purchase agreement process for the sales staff and apps that allow regional sales managers control which customers are in what buying groups. These have all been for the iPad, which has the exact of amount of screen real estate to make these apps user friendly and replace the needs to lug a laptop into a client call. In those three years I have seen a migration away from the phone for any serious type of sales tools and what I have not heard is one sales rep or business analyst or project manager request we build anything for the iWatch, except for one Apple fan boy. That’s not to say that the iWatch doesn’t have a place in the enterprise….maybe it replaces your phone as a communication device, email reader, event reminder, etc. But as a platform for serious enterprise applications it misses the sweet spot of being portable but large enough to do work on.